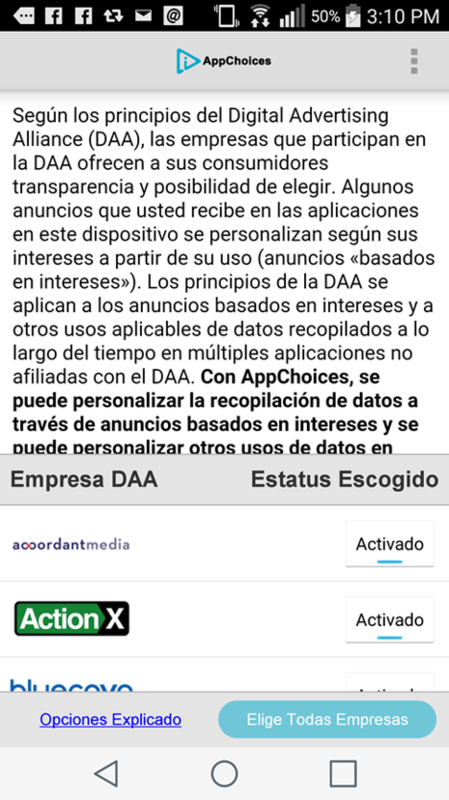 “AppChoices en Español” provides an easy-to-use interface to allow users to set their preferences for data collection and use across apps for interest-based advertising and other applicable uses. Starting today, “AppChoices en Español” is available as a free download from the major online mobile app stores, including Google PlayTM, Apple App StoreSM, and Amazon Store. Hispanic users are leading the adoption of mobile devices, according to a study from Specific Media and Starcom MediaVest Group, which showed that Hispanic Americans spent 42 percent of their total online time on a mobile device vs. just 33 percent for Non-Hispanic users. The same study showed that Hispanic Americans spend significantly more time online at 31 hours per week, compared to just 12 hours per week for non-Hispanic Americans. According the U.S. Census Bureau, there were 54 million U.S. residents of Hispanic origin in 2014, and 38.3 million people spoke Spanish at home in the U.S. in 2012, a 121-percent increase since 1990. Google Play is a trademark of Google Inc. Apple and the Apple logo are trademarks of Apple Inc., registered in the U.S. and other countries. App Store is a service mark of Apple Inc. AppChoices and the DAA Advertising Option Icon are trademarks of Digital Advertising Alliance.